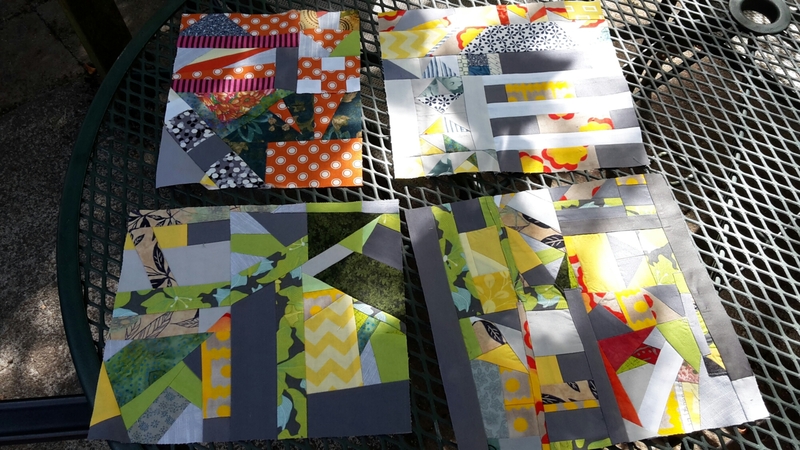 These improv mini-quilts are the result of using the scraps leftover from individual quilt projects as leaders and enders, aka thread bunnies. 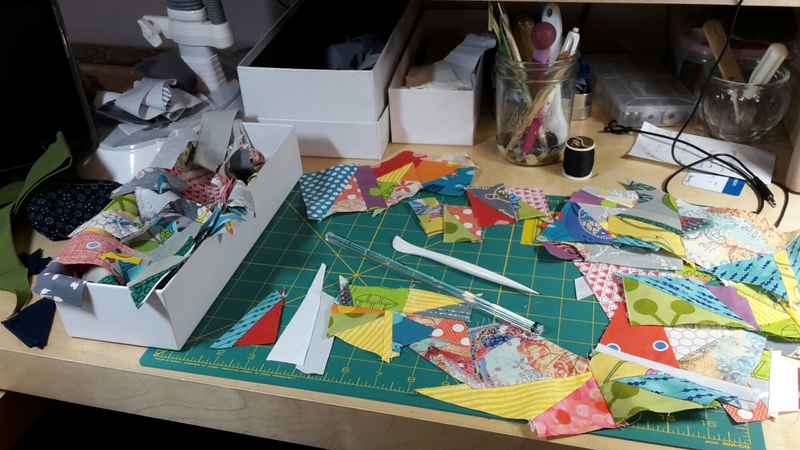 When a project is complete, I throw the scraps that are too small to return to my folded storage into a box and put it near my machine. I grab two and use them as a thread bunny. I keep building the pieces into larger pieces creating what I’ve heard called ‘found fabric’. Here is a photo of my work space at the point when I’ve started to turn the ‘found fabric’ into a cohesive mini quilt. 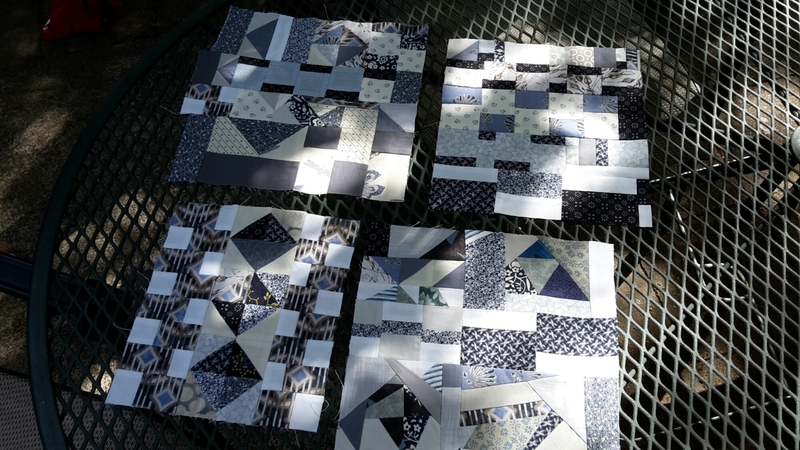 I loved Bonnie Hunter’s idea for cutting her scraps into a system of squares then matching light and dark shapes together to eventually create a whole quilt. So clever! And I tried cutting my scraps up, but I find I’m not quite disciplined enough. I just want to start sewing! I attended an improv piecing class taught by Kristin Shields a couple of years ago, and I’ve heard friends talk about playing with fabric. And this spring my lazy brain put it all together to create improv leaders and enders. My plan for these minis is to make potholders as I don’t particularly consider them works of art. But they are fun. They are using up my scraps. And I am creating something useful. So there are several ‘wins’. Here is another set made from leftovers of two blue projects. I just finished the last of these scraps. What I’ve Learned: So far I haven’t done much sorting of the scraps before I start sewing, but I think that sorting by general size or shape might be a good idea for the batch I’m working with now – lots of triangle shapes. This takes longer than working with a disposable thread bunny. So I have to remind myself that I’m actually getting two projects done at once. Last year I made 26 potholders before the holidays, and I’ve got a good jump on that this year. I agree that it takes longer than a thread bunny, but it is fun to end up with something to work with later. I hadn’t considered sorting by size (just cut off what doesn’t fit) but I have thought of sorting by color. I rather like the mix of shapes in a piece, but of course even if you sorted by shape you could still mix them up. You have managed to create designs instead of a hodge podge, and they are bright and cheerful. Thanks Claire. They are definitely fun!